We have previously discussed about the different screen size available out there, and how to optimize your website for better experience on smartphones and Tablets. Since the evolution of the internet and the advancement in display technology, the number of pixels has been increasing, from the small VGA display to the current ultra-HD 2048 x 1600 display. So webmasters have been trying forever to make use of the high resolutions and to return better value to the users. This calls for a redesigning of most major aspects of a site. Fortunately, Google AdSense team is here to help in the process. 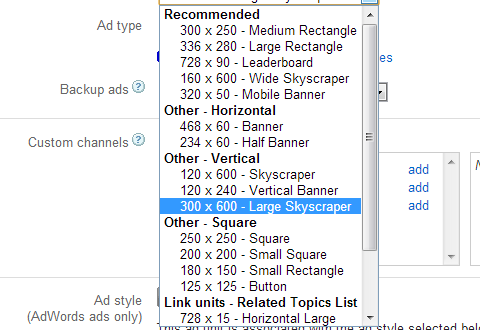 On popular demand, it has just announced a new ad size of 300 x 600 for webmasters who use AdSense. And that is the largest skyscraper ever that will surely boost your overall AdSense earning by increasing the click through rate (CTR) of all your pages. At present the skyscraper appears half filled and half vacant because advertisers just got familiar with the new size and it will take 2-3 days for the Adsense Adword market to update their campaign Ad display size and design new banners that could fit the size of 300 x 600. The new big fancy banners are on their way and will be ready to add a new boom to your overall adSense earning. We highly recommend that you add the skyscraper to middle half of your blogs in the sidebar area to make sure to increase page CPC to its maximum. You can keep the sidebar layout to 300px in width. One frequently used term with regards to varying screen sizes is Responsive Web design. Responsive content adjusts itself based on the screen size of the user's platform. For example, it could replace the ordinary 300 x 300 ad unit with a smaller, 150 x 150 one if the user's screen size is less than (or equal to) 600 pixels wide, or something similar - since a 300 x 300 ad would take up half of the screen that is just 600 pixels wide, which is not recommended. In this way, elements on your webpage 'respond' to the user's platform, and adjust themselves accordingly. These new ad sizes of 300 x 600 could come in handy for webmasters who want to return a more appropriate ad size to the user agent. The 300 x 600 ad unit, also knows as a half-page unit, goes into the 'large' category, and offers a larger space to advertisers to advertise their content, and offer users rich engagement. And so far, it seems to be pretty popular, and is one of the fastest growing ad unit sizes by way of impressions. So for publishers, it could be a better trade-off between ad space and ad revenue. It also shows advertisers prefer the larger ad size, since it better promotes their product(s). Since this ad unit is so recent, it currently only shows text ads. It'll take some time before a range of display inventory are added. So instead of worrying about the content that is being displayed, focus instead on where to place the ad, because it could play a part in your impressions. Read the following post to get a better idea.